Floreana is well known for snorkeling at Devil’s Crown, wildlife viewing at Punta Cormorant, and its mysterious history. We chat with Claudio, the owner of Lava Lodge and a Floreana native, about the island’s storied past. 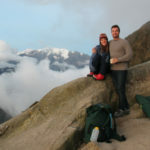 Renee, an Ecuador Trip Specialist at Knowmad Adventures (a travel company focused on active, authentic and sustainable travel in South America), first met Claudio a few years ago on a trip to the Galapagos Islands. One of her fondest memories of that trip was hearing Claudio tell stories about growing up on Floreana. Keep reading to learn more about Floreana, Claudio, and Lava Lodge. Q: Claudio, tell us a little bit about yourself… Where did you grow up and what is your connection with Lava Lodge? A: I was born in Floreana and I’ve spent my whole life working in agriculture, livestock, and tourism. I’m the eighth child of twelve, and I’m the only one that still lives on Floreana. I’m one of three owners of Lava Lodge. Q: Lava Lodge is located on Floreana, one of the first inhabited islands in the Galapagos Islands. Could you give us some insight into Floreana’s rich history? What was it like growing up there? A: Floreana Island has the most interesting human history of all of the Galapagos Islands. It is the site of the first “post office”. Floreana was the first island to be colonized by Ecuadorians and was the capital of the Galapagos Islands (Puerto Velasco Ibarra). It was a penal colony that didn’t last long because of the lack of fresh water. A few years later, Friedrich Ritter, a German doctor, arrived with his companion Dore Strauch, who suffered from multiple sclerosis. Ritter removed all of his teeth and took with him stainless-steel dentures to avoid any dental complications. Together, they set up a very successful garden and lived off of the land. In 1932 a woman named Margret Wittmer arrived with her husband Heinz. They built a house and also established an agricultural lifestyle before giving birth to their son Rolf, the first person to be born on Floreana. Floreana is well-known for being the site of several mysterious disappearances. The one that receives the most attention is that of a supposed Austrian Baroness who had arrived with her three servants after the Wittmer family. The Baroness had a colorful life full of drama and conflict. One day the Baroness disappeared from the island and nobody knew what happened to her. It is still in question today if she just left the island or if she was murdered. In 1939 my father arrived on Floreana. It was very fun and quiet growing up in Floreana. At school there were only eight children, and there weren’t any bikes, cars, etc. I had to ride a donkey to go to school. We did not have television, but my father was a man who loved reading and he told us what the continent was like. My childhood was very different from other children, because we did not have toys or other games that children usually had, but I was part of a large family full of love and enjoyed a lot of nature. When I was 33 years old I got married to Maria de Lourdes, who has been an important part of my life. She is my greatest support in my business. My children had the opportunity to spend their childhood here and they told me Floreana doesn’t compare with other cities or countries. Q: What makes the experience at Lava Lodge unique? A: Lava Lodge is an eco-friendly and peaceful place. We are located on the beach, where the passengers have the opportunity to swim with turtles, rays, sea lions etc. We are only 5 minutes away from la Loberia. But the most important, and what makes Lava Lodge different, is because of the personalized service we give to each of our travelers. I am with our travelers all the time, sharing the history of the island and my history. I am always happy to help and make their stay an unforgettable experience. Our travelers are very grateful for the service at Lava Lodge. Q: What is your favorite part about living on Floreana? A: All of my brothers went to other islands and cities and I was the only one who stayed on Floreana because I did not want to leave my father alone. I also like to work in agriculture and livestock and now tourism is part of me. What I like most about living on Floreana is that it is a place full of history, mystery, and wildlife, but at the same time it is very peaceful. Floreana has only 150 habitants and we are like one family. We help each other, we celebrate birthdays and weddings together and more. Q: Which Floreana Island excursion would you recommend for first time visitors to the island? A: The tour that I like most and I recommend to everyone who comes and visits is “Asilo de Paz.” Here you will see the cave of the first pirate that arrived to Galapagos (Patrick Watkins), and which was home of Wittmer family. You will also see the source of water that supplies the town. 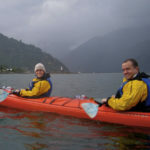 As a Knowmad traveler said after her trip to Ecuador, “Claudio makes every day a good day.” Thanks for sharing your passion with us, Claudio, and for giving us an insider’s look at such a fascinating place. 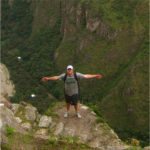 Below we share a couple of ideas to help you jumpstart the Galapagos Islands trip planning process. 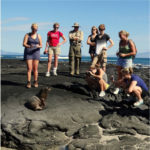 Lava Lodge Trip Idea You may be interested in this Galapagos Island Land-Based Adventure itinerary that features time at Lava Lodge on Floreana Island. 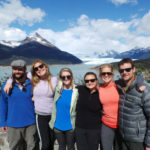 Ecuador Trip Ideas Page Click the following link for a look at over ten inspiring Ecuador & Galapagos Islands Trip Ideas. If you have any questions or would like to chat with someone about Galapagos Islands travel options, give one of our Trip Specialists a call at 612-315-2894 or send us an email at travel@knowmadadventures.com.